For more than one hundred years, the Mirro Company has been making quality aluminum products. 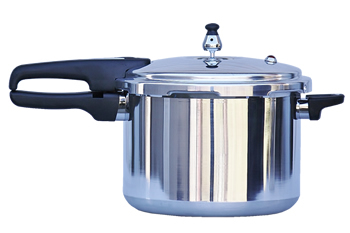 Mirro pressure cookers are constructed from a Super tough aluminum alloy. 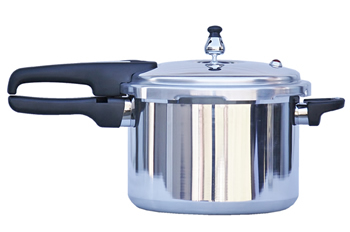 The Mirro Pressure Cooker also features a removable self-sealing gasket, safety fuse, heat proof handles with reminder ring. Mirro pressure cookers no longer include cooking racks. You can easily purchase one by measuring the inside diameter of your pot and selecting a rack that will lay flat inside. The space left around a cooking rack in your pot doesn't matter. The rack should be big enough to be functional in your pressure cooker and small enough to fit inside the pressure cooker with enough space to allow the rack to expand when heated. 1/2 Inch - 1 Inch space around the pressure cooker rack is a reasonable target for sizing. Caring for your Mirro pressure cooker does not have to be hard to do. Also, caring for your cooker properly can help to extend the lifetime of your cooker. If you've recently purchased a Mirro cooker then you need to wash it with hot soapy water and dry it well before using it for the first time. Before using your cooker you need to remember to never beat a potato masher, spoon, etc, against the pressure cooker's rim, this action can cause a dent or mar that will potentially cause it to not seal properly. The inside of your cooker needs to be cleaned after each use. An easy way to clean it is to run warm water into it as soon as the food is removed from the cooker. When you are ready to clean it, use warm soapy water. To clean: boil 1 quart water of water with 2 teaspoons of the cream of tartar. Allow this solution to boil in the pressure cooker, with the cover(lid) OFF, for a few minutes. Allow the water to cool. Clean interior with the steel-wool pad and allow to dry. (You can substitute a the cream of tartar solution with a solution made of equal parts water and vinegar). To clean the exterior, clean with silver polish occasionally. To keep your exterior from dulling never soak or cover the pan in water and do not wash in the dishwasher. After each use of your pressure cooker you will want to remove the gasket from the lid. Wash the gasket in warm soapy water, rinse, and dry thoroughly. Then put the gasket back into the cover so that your cooker is ready for its next use. You will want to be sure to always wash the cooker's cover after each use. Run hot water around the openings in the handle to keep the lift pin assembly free from food particles and grease that could keep your cooker from operating correctly. -Keep in mind that if moisture stays inside of the handle, the steam may not appear around the handle during the next use. Mirro's User Manual states that this is normal. After washing and rinsing the cooker's cover, and before using it, hold the cover up to the light so you can see through the vent tube. If you cannot see light through the vent tube then it may be blocked. To unblock your cooker's vent tube, carefully run a wire or small pipe cleaner in and out of the vent tube to be sure that the tube is clear and unobstructed. Rinse again in hot water. Your pressure control will typically stay clean as the steam that comes out of the cleaner serves as almost a self cleaning for the pressure control. However, it will not harm the control if you choose to wash it in warm, soapy water. Be sure to rinse thoroughly after washing. To store your Mirro pressure cooker: store it with the cover off, or upside down on the cooker. Do not store with cover and gasket tightened on. Storing it with the cover tighted on can cause a vacuum seal inside of your pressure cooker making the cover nearly impossible to remove.